AVI is a multimedia container format, containing both audio and video data in a file container that allows synchronous audio-with-video playback. It might be one of the most used file format for saving video files online and offline. You can easily get hundreds of AVI video from the internet. But when trying to play these AVI videos on iPod, you'll find that it can not be played on iPod. AVI videos are not on iPod's video list, you must convert AVI video codec to iPod friendly formats and then transfer the output video files to your iPod with the sync of iTunes Library. There are lots of programs that can convert AVI to iPod video. This article is for all those iPod owners still in fix and searching for easy way to play AVI videos on iPod. 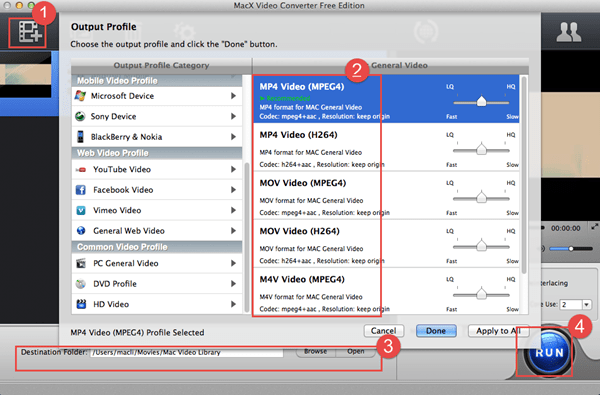 MacX Video Converter Free brings an easy and effective way to transcode AVI to iPod and then you can enjoy AVI on iPod without any hassle. What's more, it is 100% free which means no using 30 day trials. Best-ever Mac freeware to decode and encode AVI to iPod (iPod Touch 4/5/6, Shuffle, Nano, iPhone/iPad) with fast speed and no quality loss. 100% free and clean of virus, plugin. After download MacX Video Converter Free and install it, launch it on your macOS, click "Add File" to load the AVI files. Select iPod format from the format list. It offers optimized presets for iPod, iPod Mini, iPod Touch, i.e. you can choose the output format according to the iPod model you have. Besides AVI to iPod video conversion, it also supports transcoding among a diverse array of high-definition formats like MKV, AVCHD, M2TS etc, and SD video formats including AVI, MPEG, MP4, DivX, XviD, MOV, FLV, RM, RMVB, WebM, Google TV, etc. But if you need to convert videos to mobile devices like iPod Touch 4/5/6, iPhone X/8/7/Plus, iPad Pro/mini 4/Air 2, Android with the world's fastest speed, the advanced version MacX Video Converter Pro will be your best bet. Download YouTube MP4, FLV videos and convert to iPod touch 4/5, iPhone 4/5, iPhone 3GS, iPhone 3G, iPad with MacX Video Converter Pro. Working as YouTube downloader and FLV video converter, it helps Mac users to convert all HD and mainstream videos to WMV, AVI, MP4, MOV, VOB, FLV, MPEG, etc for playback on iPhone, iPod, iPad, PSP, mobile phone, and more. Here's a list of top free Mac video processing tools for you to transcode among HD and SD videos on Mac OS for free, like MKV to AVI, AVI to MP4, etc and sync video to iPhone (iPhone Xs), iPad (iPad Pro), iPod, Android. 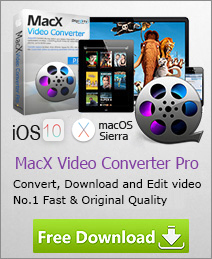 Do not miss this to encode video free with best mac freeware.